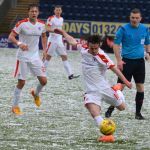 Fans converged on Falkirk though sleet, arriving in time to watch the lines being cleared of snow by the grounds staff. 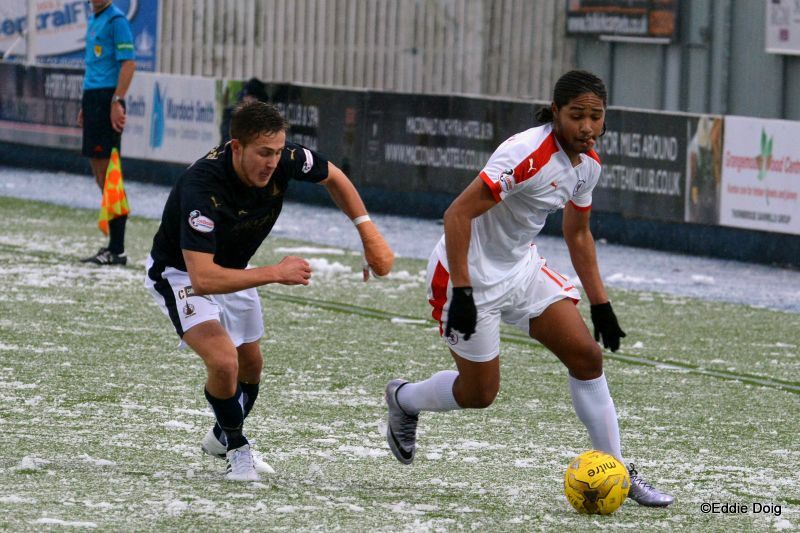 Harry Panayiotou made his first start coming in with Craigen, as Davidson and Longridge made way. 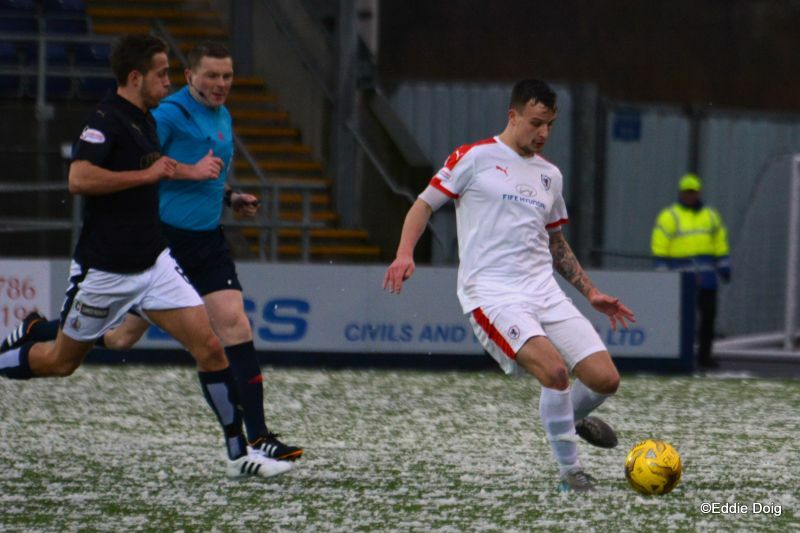 Jason Thomson was again in on the bench after his injury layoff. The hosts had ex Rovers John Baird and Paul Watson starting. 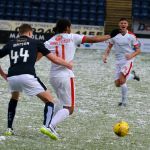 Falkirk sent in a dangerous cross in the second minute then saw a home man flagged for being more than a little offside. 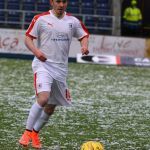 A great ball to the home number 10 Sibbald found him in space wide but David Bates did well closing down. The resulting corner went through Cuthbert’s hands but the danger passed. 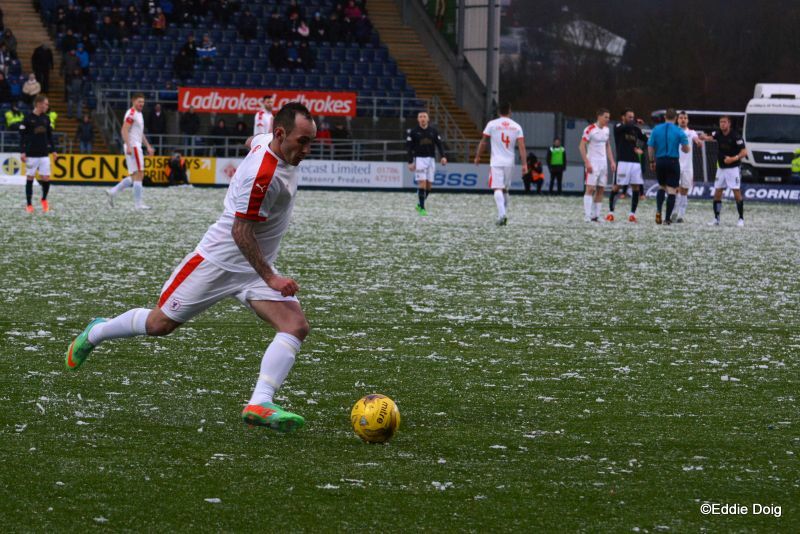 In the 8th minute Stewart linked with Connolly, Mark hitting a dipping shot just over. Lee Miller nearly got on the end of a dangerous cross pulling Toshney’s shirt as the home side continued their good start. 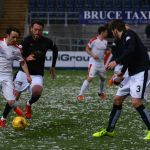 In the 11th minute a chant of “One Ally Gourlay” began which would perhaps have embarrassed him. Rovers fans and many, many others were deeply saddened to hear of his passing last weekend. 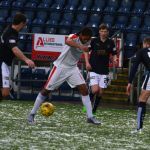 As the Bairns continued to push Alston shot on the turn feebly then a free kick from deep found a host in an offside position. 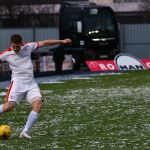 The Rovers hadn’t really managed to get hold of the ball and the home side were looking dangerous. 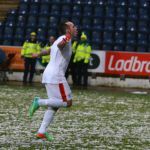 A good ball into the Rovers box found Blair Alston with more than enough time and space to pick his spot, sliding the ball past the exposed Cuthbert – a good way to mark his 200th Falkirk appearance. 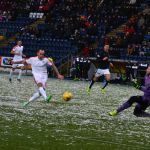 The Rovers tried to respond instantly with Stewart getting one on one with the home keeper Rogers who dashed out and blocked well. 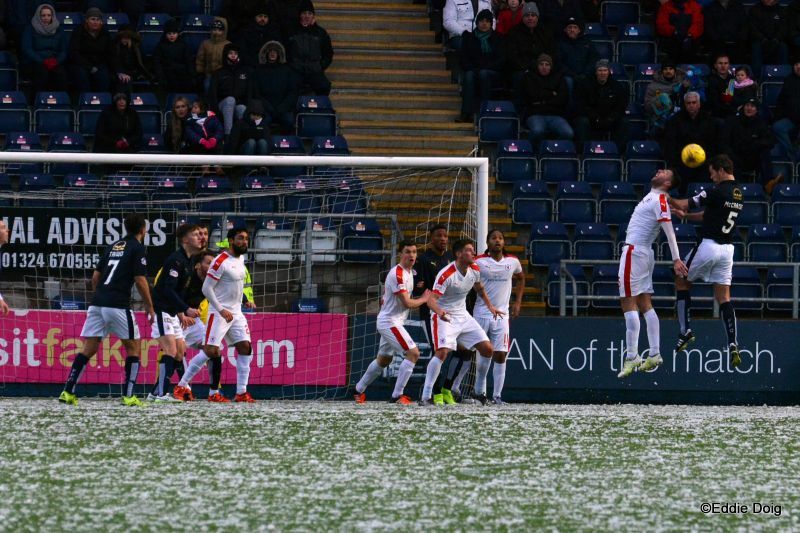 The Rovers however scored moments later when James Craigen managed to fire a low shot from the edge of the box through a forest of legs and in off the inside of the post. Connolly did well wide but his squared ball was scuffed wide. 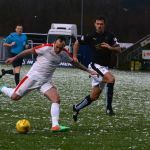 Sibbald raised the ire of the travelling fans when he fell to the ground in front of Bates – perhaps he’d been hit by a gravitational wave. 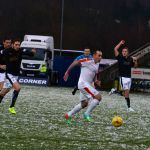 Having been awarded the at best dubious free kick the home side nearly scored when McCracken headed down but Cuthbert blocked it away brilliantly. From the resulting corner Miller rose at the back post where Toshney was outnumbered two to one but the downward header went just wide. 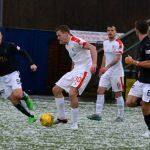 In the 20th minute Kerr lined up a free kick and his ball in found McCraken who rose five yards out with Toshney and the ball went past Cuthbert into the net. 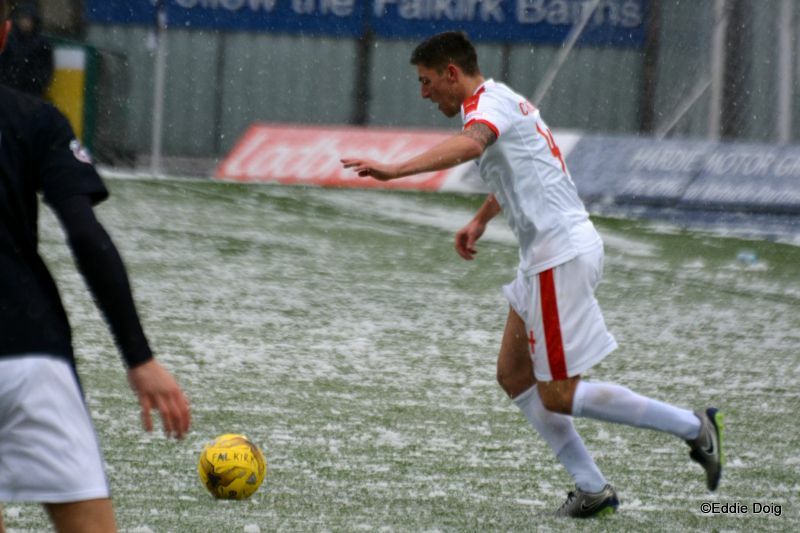 It looked like it came off Toshney’s shoulder but David McCraken was credited with the second goal. The home side tried to extend their advantage with Kerr hitting a shot over from 20 yards then Panayoitou who’d shown some good touches won a corner with quick feet. 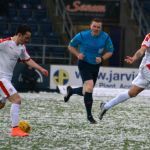 Paul Watson was rightly penalised for taking down Harry off the ball as the Rovers tried to get into the game. Connolly shot wide after a deflection but his effort went high and wide. 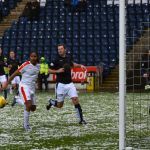 Falkirk however came closer to getting a third when Sibbald found space in the Rovers box, his shot beat Cuthbert but Toshney was alert knocking the ball off the line. As the Rovers tried to get into the game Craigen played a pass across to Harry who’s low ball into the box was claimed by the keeper. 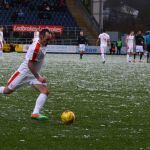 In the 37th minute our man from the Premiership leaders took his gloves off discarding them on the slushy plastic surface. A ball behind the home back four was chased by Stewart who realising he was offside left it to the fleet footed Panayiotou, his pass found Connolly who’s effort was blocked. A couple of minutes later Aiden had another effort which went up and over from the edge of the box. The final action of the first half was at the sideline where Connolly was flattened by a home man who went unpunished. The Rovers fans spent half time discussing the fact the hosts had missed a couple of good chances to extend their lead. A kent face from the main stand at Starks was a little surprised to receive birthday wishes over the PA. 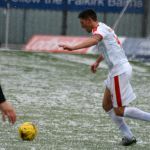 The first action of the second half saw Harry and Aiden combined but the ball was claimed by Rogers in the home goal. 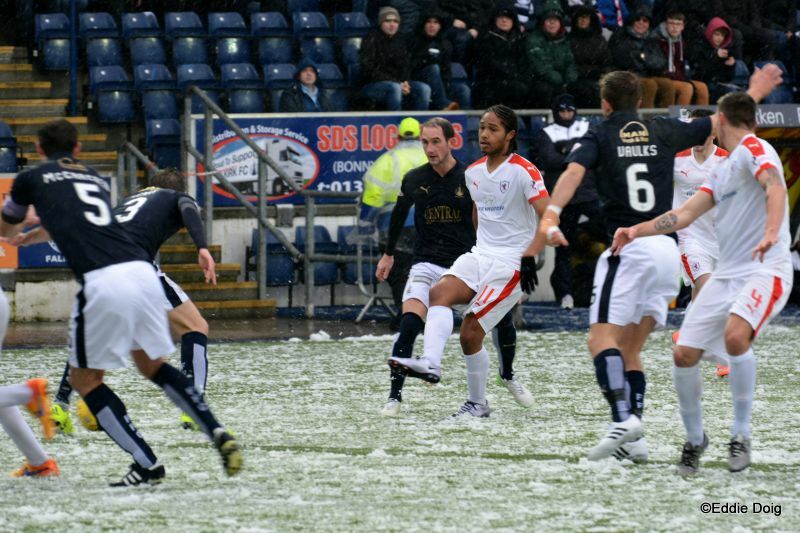 Falkirk however continued to do well and a corner was headed wide by a home man as they pressed for a third. 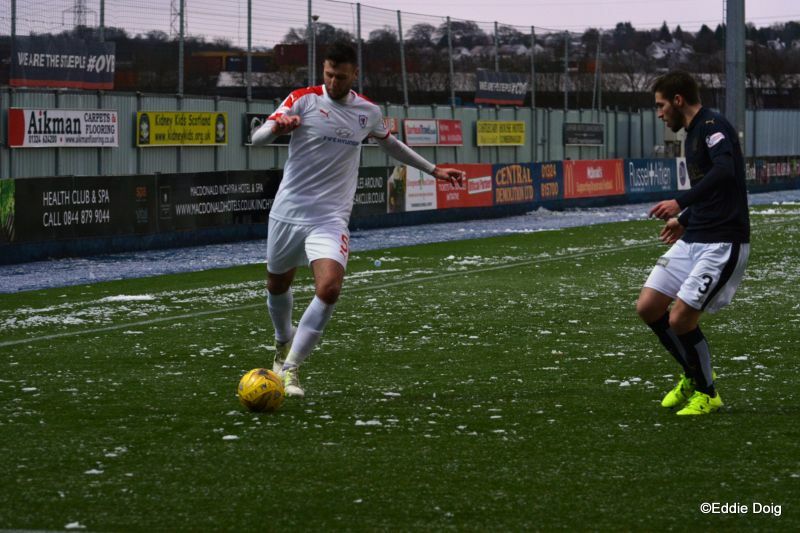 A bad pass in the 50th minute by Craigen went straight to Sibbald who scampered towards goal, Benedictus got back and tackled very well to remove the danger before making his thoughts on the matter clear to his teammate. 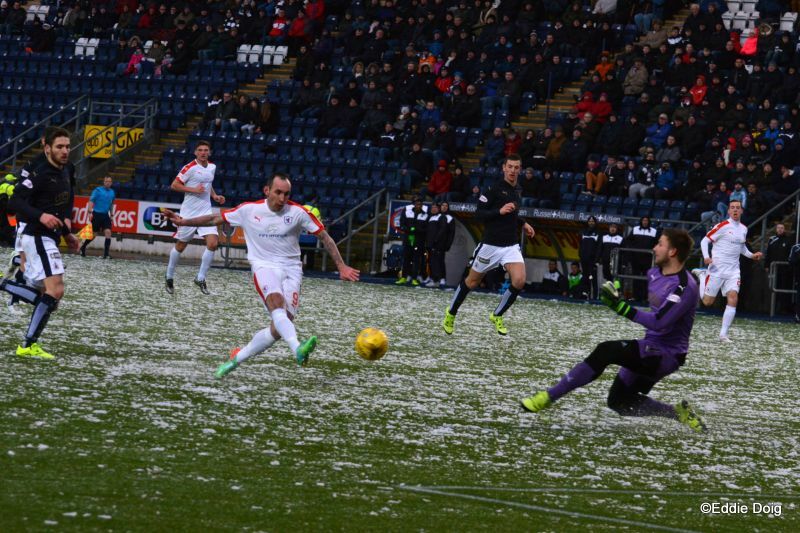 Another effort, this time from Miller was blocked on the Rovers goal line. John Baird – who’d been busy throughout – was next to threaten but his shot was weak, moments later he did better forcing a save. 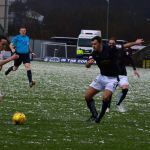 Still Falkirk pushed on and a free kick went wide then on the hour the Rovers broke up the park towards their fans following the home side’s fifth corner of the second half. Thomson came off the bench with Longridge replacing Bates and Craigen. 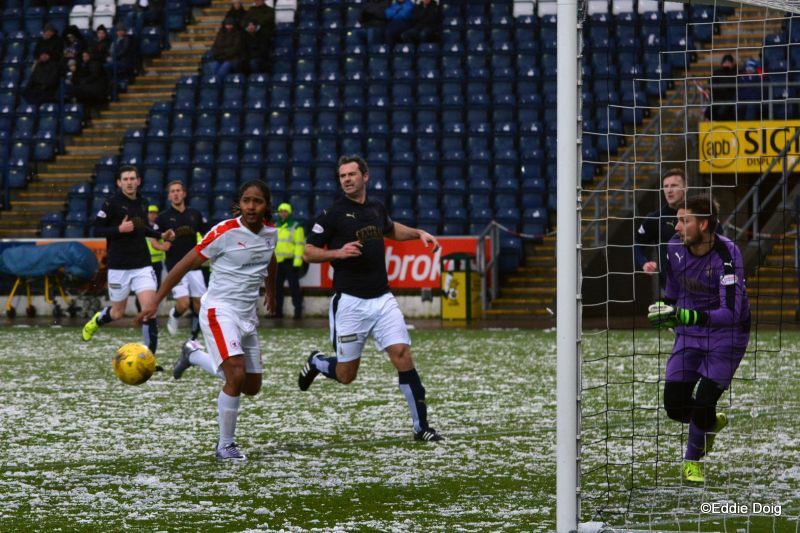 Almost instantly Jason did well wide and McKeown following up hit the clearance high and wide. As the Rovers at last got going a Stewart cross eluded Panayiotou falling to Connolly wide who’s dipping effort went past the far post. 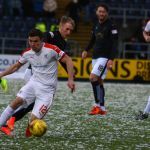 Thomson then combined with Connolly and Stewart was floored by Watson in the box as a dangerous ball went into the box for him. Despite Mark’s protestations and the cries of the visiting support the officials took no action. 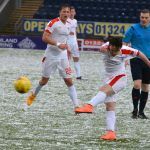 The ex-Bairn felt a little better moments later when he got onto a great ball from Benedictus firing it past Rogers just inside the post. 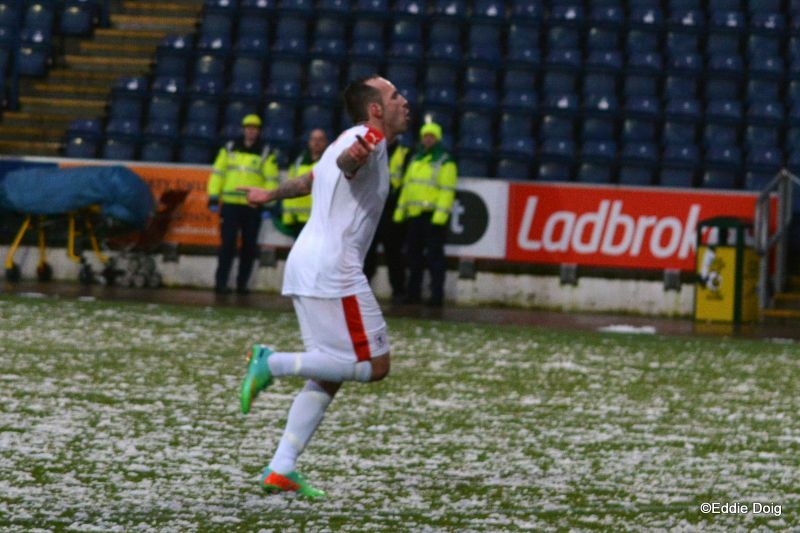 Mark Stewart clearly enjoyed the goal, the Raith number 9 hitting the back of the net with a numberless shirt. He’d earlier had to swap for a new top after a challenge left him bleeding. 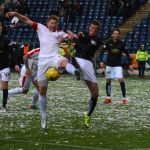 Falkirk had a spell of pressure as they tried to take the lead for a third time but Watson took the pressure off the Rovers giving away a corner with a mistake. 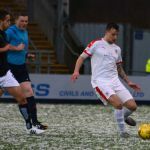 Matthews came on for Robertson with fifteen minutes to go just before Stewart was blocked again as the Rovers tried to get a winner and the home side looked like they were rocking… A Raith corner whipped through the box eluding everyone then with eight minutes left Benedictus fouled sub Hippolyte and ref Beaton flashed a red card. Forced to re-organise the Rovers moved Thomson into the middle and Matthews to right back. 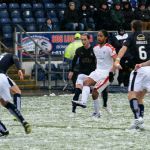 Falkirk tried to push on with their one man advantage, which increased for several minutes after Thomson tangled with Hippolyte on the sideline and had a boot flicked into his face. What turned out to be a broken nose for the skipper meant he had to change his shirt before getting back on the park only to be sent back for another and then a new set of shorts as the medical staff tried to stem the flow of blood. 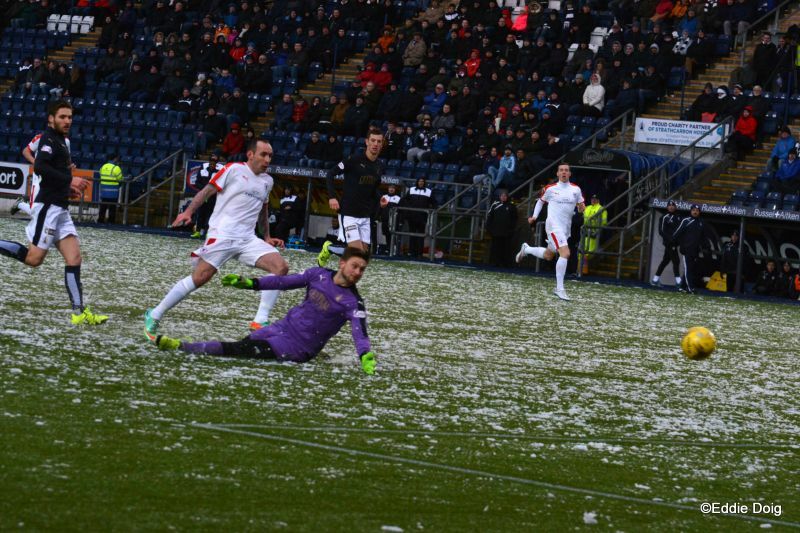 Meanwhile the home side tried to press home their two man advantage as the remaining Rovers dug in. Stewart was booked then Longridge broke up the field and shot tamely rather than head for the corner flag. 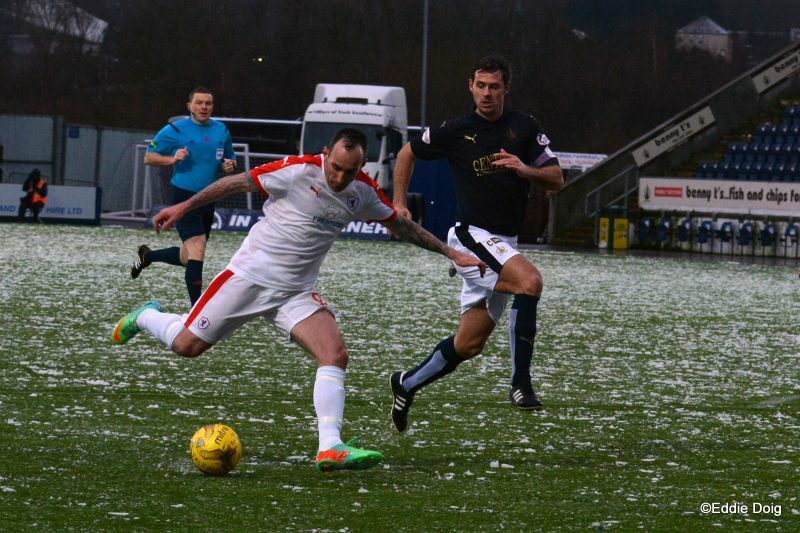 A late Falkirk corner was scrambled away after Beaton ignored a climbing home man all over a defender. The last opportunity fell to a home man who shot wide and the final whistle was greeted by cheers from the travelling support. The Rovers came away bruised and bloody with a point after early on it looked like the game could go away from them. 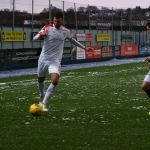 McKinnon’s men dug deep and the substitutions helped turn things around against a very good side. Harry looked lively and Connolly did well. Over the piece there were some good signs even if the people who wash the tops and physio’s towels won’t be as happy with the outcome as the rest of us. 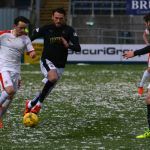 Welcome to The Falkirk Stadium, it's 2 degrees, the pitch has thin layer of snow and the ground staff are clearing the lines. This week we lost a good friend in Ally Gourlay, his passing will be marked next Saturday at the Livingston game. 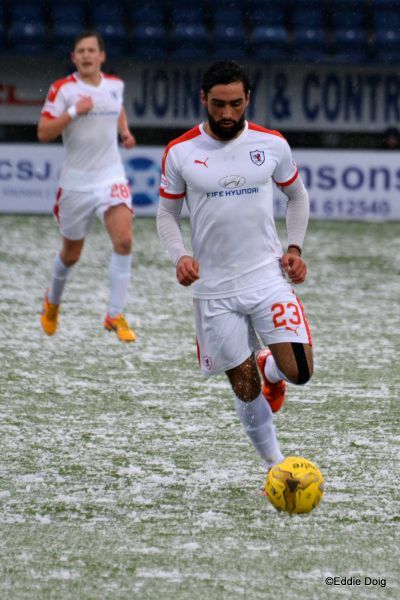 Jason Thomson comes back into the squad after injury, he had a good run out on Monday in the Development game. Mr Beaton and his assistants are going through their warm up routine so all must be well with local conditions. Rovers wearing the third strip today. Falkirk kick off towards the away support. 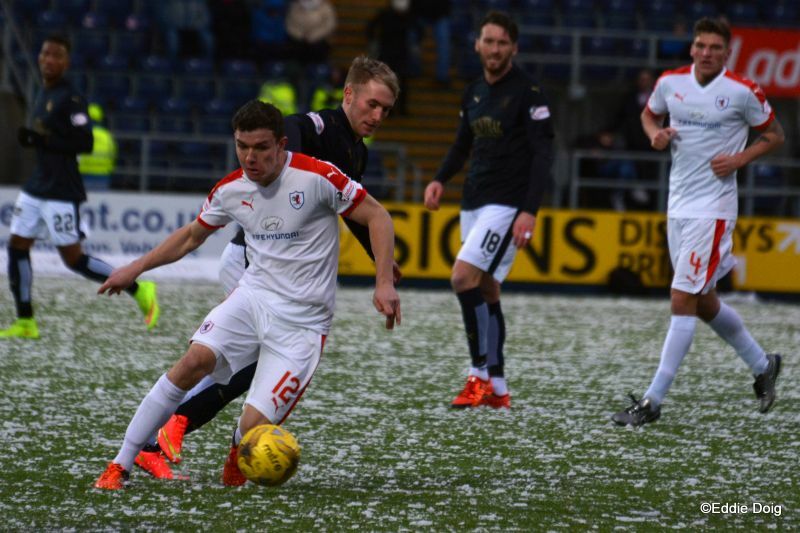 Sibbald swinging in a cross from the left, the ball evading any player. The light snow us mixed with rain. Leahy thought he was through but the assistant flagged offside. Sibbald has a shot blocked by McKeowan. Cuthbert fumbled the corner but the ball is cleared. Bates penalised for taking a country mile with his throw in. Connolly back heels to Stewart his shot going just over the bar. 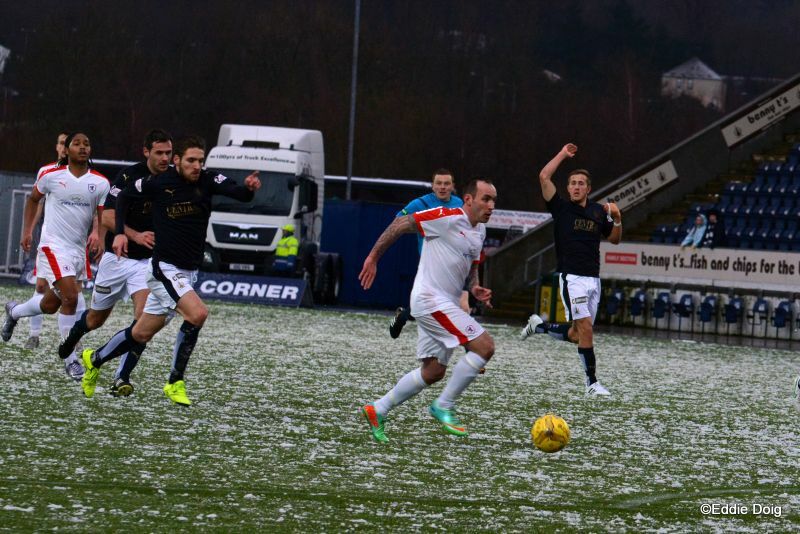 Shouts for a penalty as Miller tumbles in the box, alas he slipped. 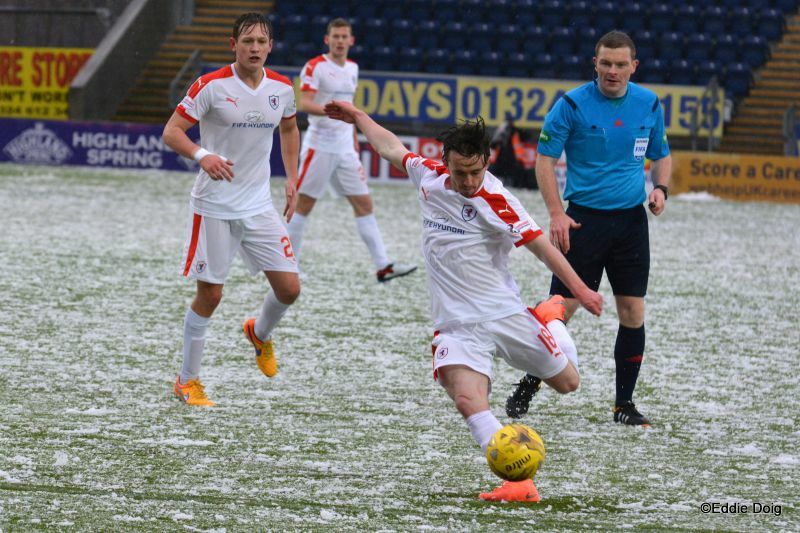 McKeown took a wee tumble but gets back to his feet. 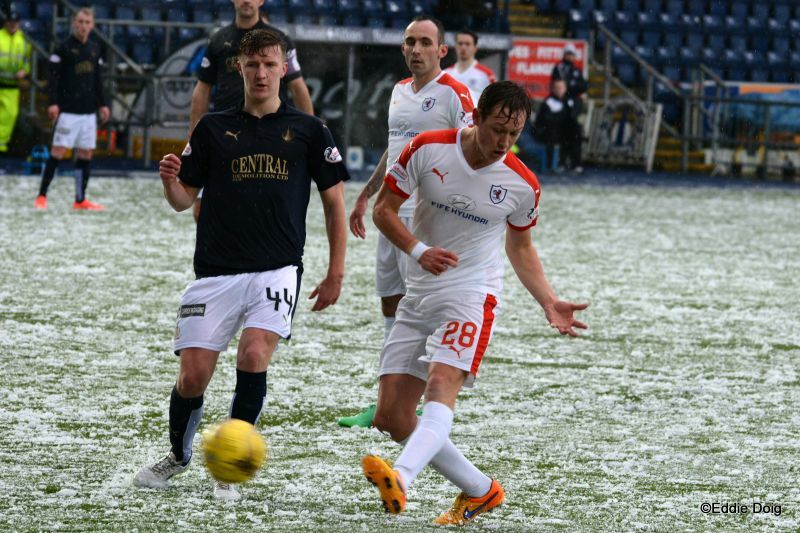 Goal Falkirk, in his 200th game for the club Alston the recipient of a one two slots past Cuthbert. Goal Rovers, from the edge of the area Bates puts the ball in the net coming off the left post. McCracken heads downwards and Cuthbert turns the ball past the post. 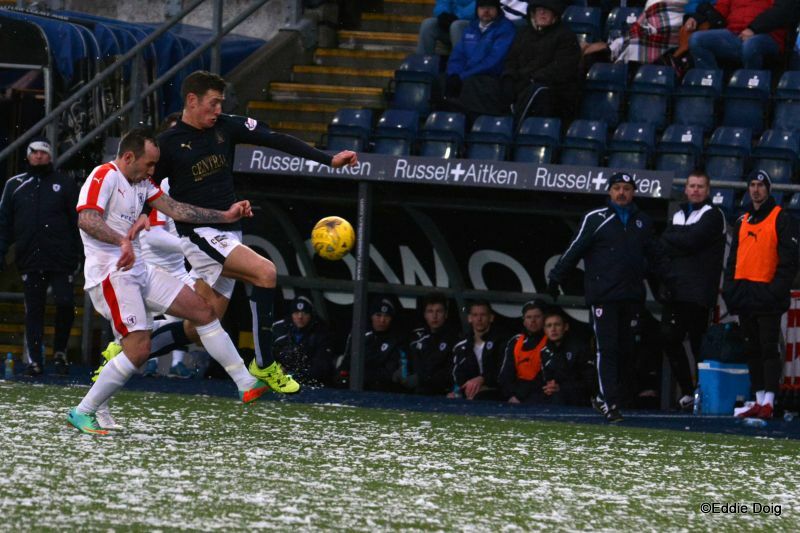 Goal Falkirk, Kerr's free kick found the head of McCracken who bulleted the ball past Cuthbert. 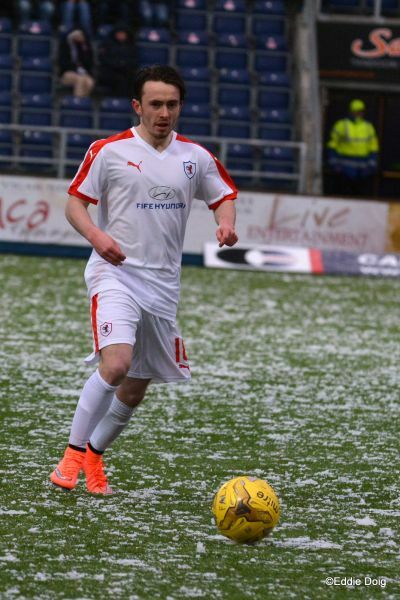 Correction, the Rovers goal was scored by James Craigen. 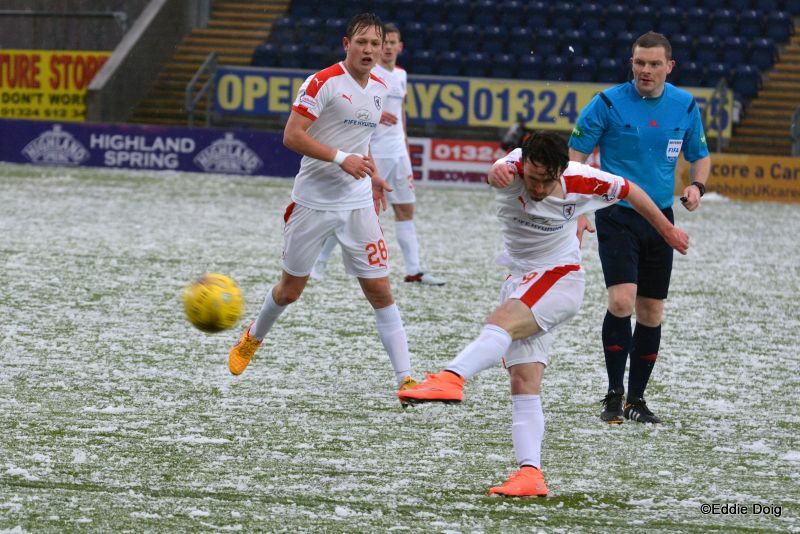 In a bizarre off the ball incident Craigen wins A free kick. 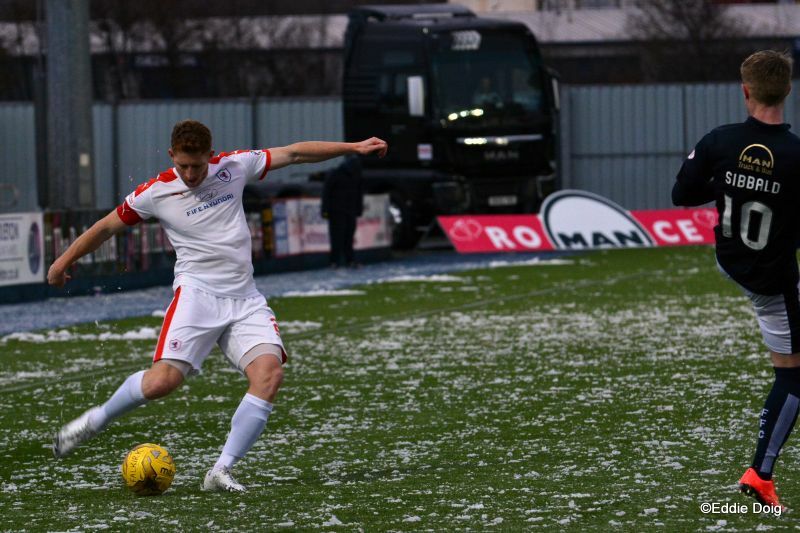 Sibbald fires 6 yards wide from the same distance. 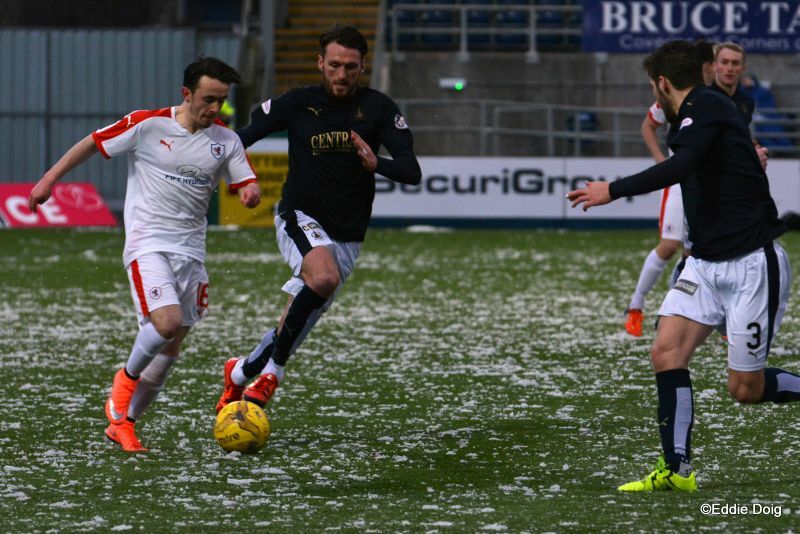 Bairdy the poacher complains about an offside flag. 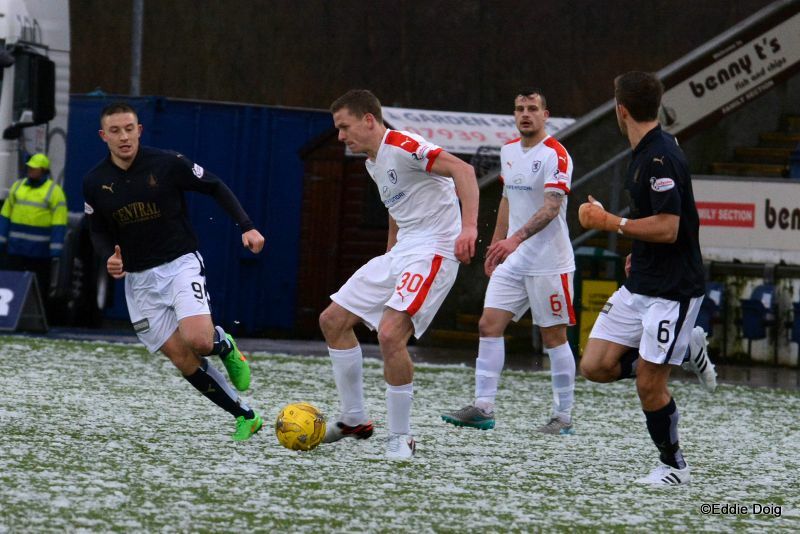 Baird in the Valentines mood gives McKeowan a cuddle but still didn't win the ball. Rovers trying to hold onto the ball, a lot of passing the ball on the deck between the backs and midfield. 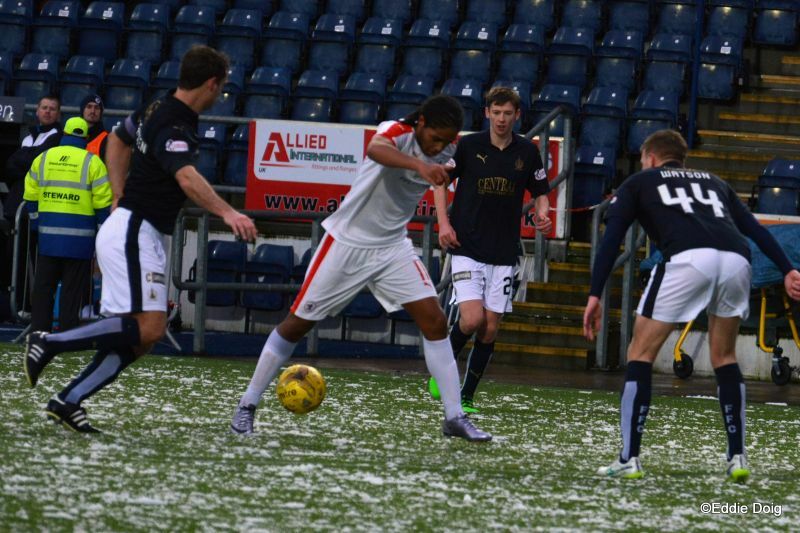 A Falkirk player is down in a heap. 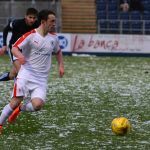 Sibbald returns to the field. 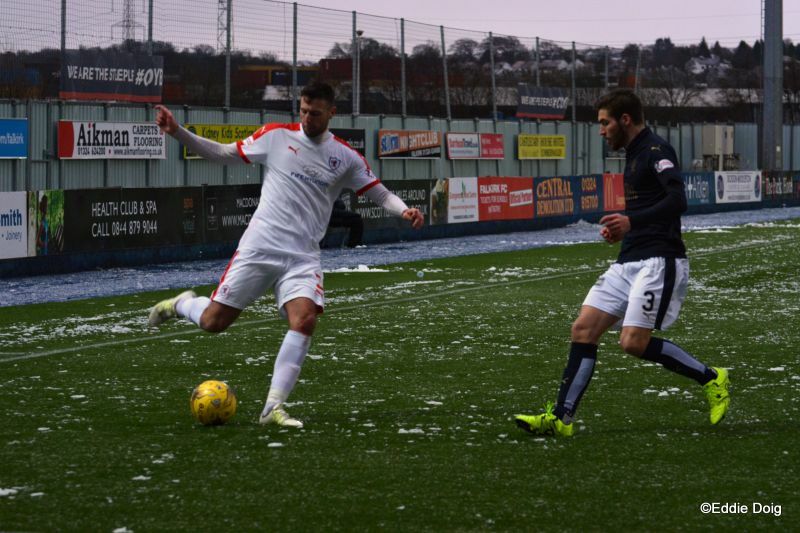 Mr Beaton receiving grief from the home support for delaying the return of Sibbald to the field. Connolly and Panayiotou combining well down the right. Craigen on the left whips in a cross but Rogers cleared. 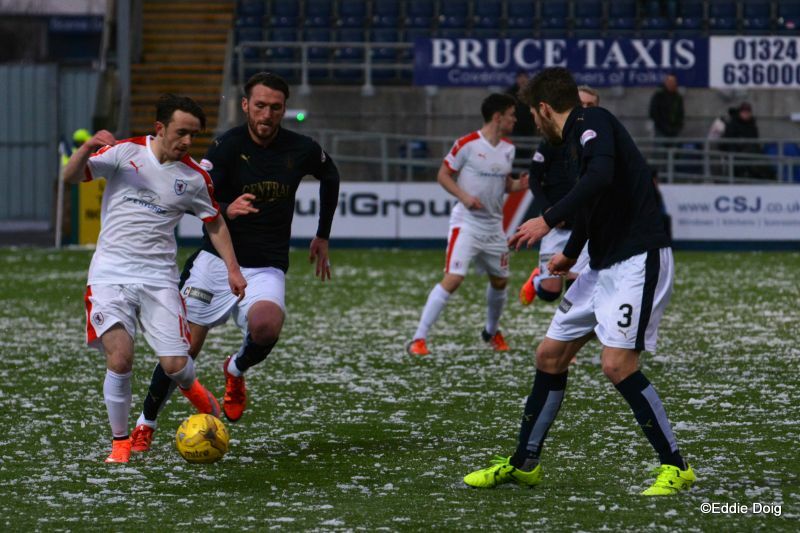 Falkirk doing all of the pressing, finally relieved with a bye kick. 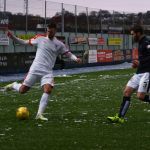 Craigen with a slack lateral pass sees Sibbald collect and McKeowan put the ball out for a corner. Baird one on one with McKeowan tried to chip Cuthbert from the edge of the box but the ball could only trundle towards Cuthbert. Stewart forced to change his shirt due to a nose bleed returns to the field. Alston fires a free kick narrowly wide of the left post. As the Inuit people say, it's a three dog night here in Falkirk. Benedictus and Callachan combined but the pass to Panayiotou saw the player offside. Bates and Craigen off, Thomson and Longridge on. 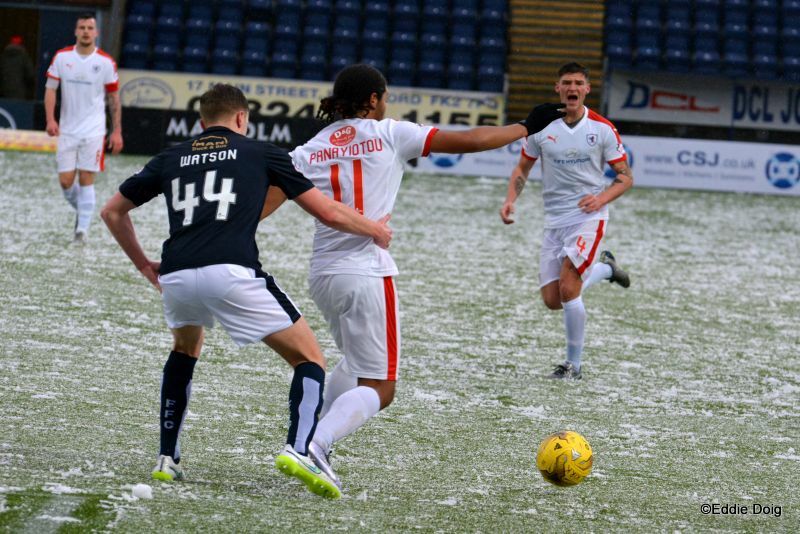 Benedictus hands the Captains armband to Thomson. Connolly crosses from the right and his 'shot' nearly goes in at the back post. Thomson threads a beautiful pass to Connolly but the ref misses Stewart being pushed to the ground in the box taking the player out of the equation. GOAL ROVERS, Connolly the provider, Stewart the finisher from just inside the box. Alston and Baird off, McGrandles and Hippolyte on. 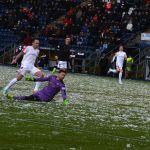 The snow is gradually clearing from the pitch. 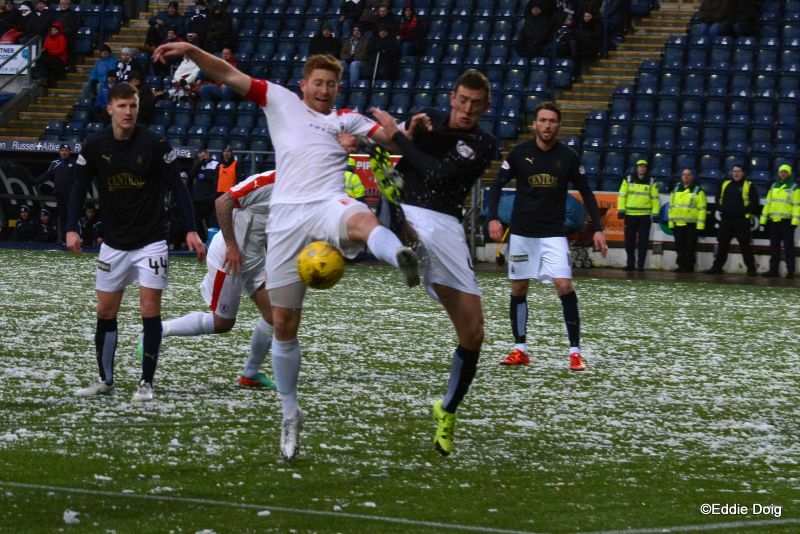 Mayhem in the stand as the ref waves on play after a Falkirk player goes to ground. Callachan tries to chip Rogers from the edge of the box, the ball just wide of the back post. 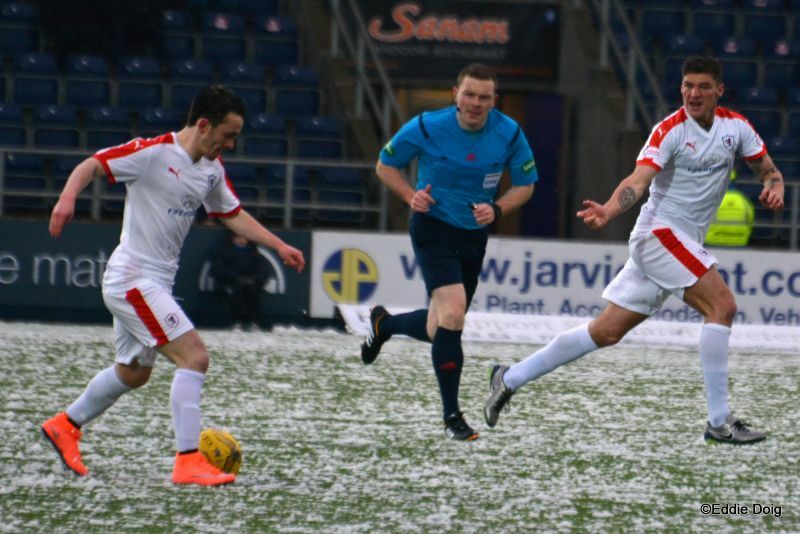 Stewart stuttering as he is put through, he thought he was offside. 353 away fans of 3956 at today's game. Straight red for Benedictus for a rash challenge. Thomson moving to CB and Matthews going to RB. Thomson injured in a wrestling match with Hippolyte. Thomson receiving attention to his face. Thomson told to change his shirt. +1 Rovers survive an onslaught and Thomson now has to change his shorts. +2 McGrandles shoots past the post and after 5 minutes Thomson is allowed back on the pitch. 10 man Rovers hang on for a creditable draw. Rogers, Leahy, Muirhead, McCracken, Vaulks, Alston, Baird, Sibbald, Kerr, Miller, Watson. Subs, Mehmet, Taiwo, Smith, McHugh, Hippolyte, McGrandles, O'Hara. 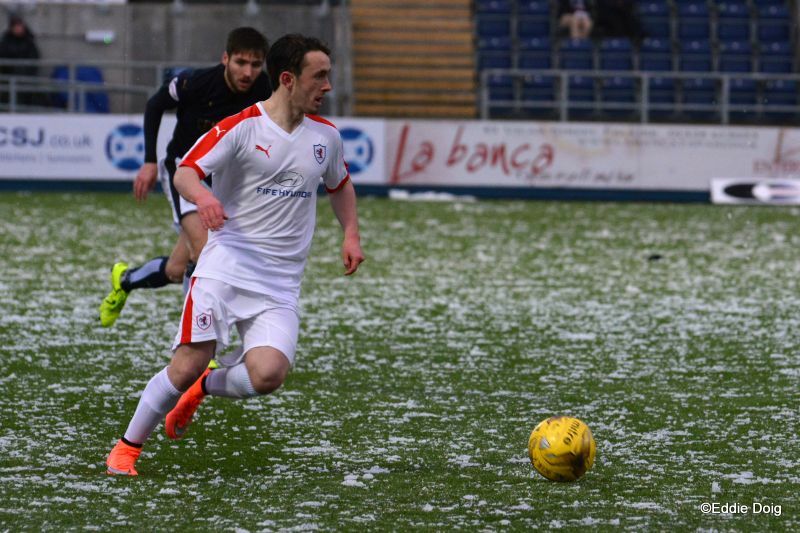 Raith Rovers, Cuthbert, Callachan, Toshney, Benedictus, Stewart, Panayiotou, Connolly, Bates, McKeowan, Craigen, Robertson. Subs, Law, Thomson, Anderson, McCord, Matthews, Longridge, Court.